This week’s study is from Tehillim / Psalms 57:1-11, the psalm opens saying, א לַמְנַצֵּחַ אַל-תַּשְׁחֵת לְדָוִד מִכְתָּם בְּבָרְחוֹ מִפְּנֵי-שָׁאוּל בַּמְּעָרָה: For the choir director; set to Al-tashheth. A Mikhtam of David, when he fled from Saul in the cave. (NASB) David seeks the Lord when destruction is near, ב חָנֵּנִי אֱלֹהִים | חָנֵּנִי כִּי בְךָ חָסָיָה נַפְשִׁי וּבְצֵל-כְּנָפֶיךָ אֶחְסֶה עַד יַעֲבֹר הַוּוֹת: 57:1 Be gracious to me, O God, be gracious to me, For my soul takes refuge in You; And in the shadow of Your wings I will take refuge Until destruction passes by. (NASB) What is the significance of the phrase “shadow of Your wings?” David continues saying, ג אֶקְרָא לֵאלֹהִים עֶלְיוֹן לָאֵל גֹּמֵר עָלָי: ד יִשְׁלַח מִשָּׁמַיִם | וְיוֹשִׁיעֵנִי חֵרֵף שֹׁאֲפִי סֶלָה יִשְׁלַח אֱלֹהִים חַסְדּוֹ וַאֲמִתּוֹ: 57:2 I will cry to God Most High, To God who accomplishes all things for me. 57:3 He will send from heaven and save me; He reproaches him who tramples upon me. Selah. God will send forth His lovingkindness and His truth. (NASB) Why does David state that his soul is among lions? (ה נַפְשִׁי | בְּתוֹךְ לְבָאִם אֶשְׁכְּבָה לֹהֲטִים בְּנֵי-אָדָם שִׁנֵּיהֶם חֲנִית וְחִצִּים וּלְשׁוֹנָם חֶרֶב חַדָּה: , 57:4 My soul is among lions; I must lie among those who breathe forth fire, Even the sons of men, whose teeth are spears and arrows And their tongue a sharp sword. NASB) Even though men plot against David, he gives glory to the Lord Almighty. What a great example this is to us to exalt the name of God even in the midst of troubles, ו רוּמָה עַל-הַשָּׁמַיִם אֱלֹהִים עַל כָּל-הָאָרֶץ כְּבוֹדֶךָ: 57:5 Be exalted above the heavens, O God; Let Your glory be above all the earth. (NASB) David says his enemies, ז רֶשֶׁת | הֵכִינוּ לִפְעָמַי כָּפַף נַפְשִׁי כָּרוּ לְפָנַי שִׁיחָה נָפְלוּ בְתוֹכָהּ סֶלָה: 57:6 They have prepared a net for my steps; My soul is bowed down; They dug a pit before me; They themselves have fallen into the midst of it. Selah. (NASB) David realizes that the Lord in heaven has the power to save both body and soul from destruction, ח נָכוֹן לִבִּי אֱלֹהִים נָכוֹן לִבִּי אָשִׁירָה וַאֲזַמֵּרָה: ט עוּרָה כְבוֹדִי עוּרָה הַנֵּבֶל וְכִנּוֹר אָעִירָה שָּׁחַר: י אוֹדְךָ בָעַמִּים | אֲדֹנָי אֲזַמֶּרְךָ בַּל-אֻמִּים: יא כִּי-גָדֹל עַד-שָׁמַיִם חַסְדֶּךָ וְעַד-שְׁחָקִים אֲמִתֶּךָ: יב רוּמָה עַל-שָׁמַיִם אֱלֹהִים עַל כָּל-הָאָרֶץ כְּבוֹדֶךָ: 57:7 My heart is steadfast, O God, my heart is steadfast; I will sing, yes, I will sing praises! 57:8 Awake, my glory! Awake, harp and lyre! I will awaken the dawn. 57:9 I will give thanks to You, O Lord, among the peoples; I will sing praises to You among the nations. 57:10 For Your lovingkindness is great to the heavens And Your truth to the clouds. 57:11 Be exalted above the heavens, O God; Let Your glory be above all the earth. (NASB) The grace and truth of God is certainly reason to give glory to the name of the Lord. Halleluia! This week’s study is from Tehillim / Psalms 57:1-11, the psalm opens saying, א לַמְנַצֵּחַ אַל-תַּשְׁחֵת לְדָוִד מִכְתָּם בְּבָרְחוֹ מִפְּנֵי-שָׁאוּל בַּמְּעָרָה: For the choir director; set to Al-tashheth. A Mikhtam of David, when he fled from Saul in the cave. (NASB) Here we find the words “Al-tashheth” (אַל-תַּשְׁחֵת) transliterated into the English language. The word “Al” (אַל) is an adverb meaning “don’t, it is forbidden to; not, no,” and the word “tashheth” (תַּשְׁחֵת) is from the root word “Shakhat” (שחת) meaning “destruction.” The opening phrase in the Psalm from the MT appears to be related to “not causing destruction” upon Saul in the cave. Why do the translators choose to transliterate these words into English? The Septuagint states μὴ διαφθείρῃς meaning “do not utterly destroy.” The entire verse states, 57:1 εἰς τὸ τέλος μὴ διαφθείρῃς τῷ Δαυιδ εἰς στηλογραφίαν ἐν τῷ αὐτὸν ἀποδιδράσκειν ἀπὸ προσώπου 57:1 To the director; do not utterly destroy; to David; for an inscription on a monument; in his running away from the face of Saul into the cave. (LXX) The Aramaic Targum states, א לשבחא על עקתא בזמן די אמר דוד לא תחביל אתאמר על יד דוד מכיך ושלים במערקיה מן קדם שאול באוספלידא׃ 57:1 For praise, concerning the distress at the time when David said, “Do not harm.” It was spoken by David, humble and innocent, when he fled from Saul’s presence in the cave. (EMC) The transliterated words which mean to not destroy, is consistent with both the Septuagint and the Aramaic Targum to not do harm to Saul, therefore David was innocent before God and man. David preserved the life of God’s anointed one (Saul). Considering the Hebrew text, the words “Al-tashheth” (אַל-תַּשְׁחֵת) draws in a Torah context from Shemot / Exodus 12 and the story of Pesach (Passover) where the Lord tells Moshe this shall be the beginning of months. On the tenth of the month they are to take a lamb, slay the lamb, take the blood and spread its upon the door posts of their house, and roast the lamb by fire and eat it until morning having their cloths on and sandals on your feet and staff in hand because this is the Lord’s Pesach (Passover) (Shemot / Exodus 12:1-11). The blood is to be a sign so that the Lord will pass over the house and the first born will not die (יג וְהָיָה הַדָּם לָכֶם לְאֹת עַל הַבָּתִּים אֲשֶׁר אַתֶּם שָׁם וְרָאִיתִי אֶת-הַדָּם וּפָסַחְתִּי עֲלֵכֶם וְלֹא-יִהְיֶה בָכֶם נֶגֶף לְמַשְׁחִית בְּהַכֹּתִי בְּאֶרֶץ מִצְרָיִם:) (12:13). The Lord declares that this shall be an everlasting statute that must be observed (הַזֶּה לְדֹרֹתֵיכֶם חֻקַּת עוֹלָם) (12:17). Beginning on the fourteenth day the feast of unleavened bread begins (Shemot / Exodus 12:18-12:25). The Lord strikes dead the first born of Egypt and as a result the Egyptians sent the people out in haste out of fear that they would all die if they remained any longer (12:33). The Lord declares that this will be remembered as a feast to the Lord, that the Torah of the Lord will be in your mouth and remember that the Lord brought you out of Egypt by a mighty hand (13:1-16, ט וְהָיָה לְךָ לְאוֹת עַל-יָדְךָ וּלְזִכָּרוֹן בֵּין עֵינֶיךָ לְמַעַן תִּהְיֶה תּוֹרַת יְהוָֹה בְּפִיךָ כִּי בְּיָד חֲזָקָה הוֹצִאֲךָ יְהוָֹה מִמִּצְרָיִם:). The word from the Psalm that draws in the context from the Torah on Passover is the word “Hamashkhit” הַמַּשְׁחִית from Parashat Bo, פרשת בא ספר שמות פרק יב פסוק כג וְעָבַר יְהוָֹה לִנְגֹּף אֶת-מִצְרַיִם וְרָאָה אֶת-הַדָּם עַל-הַמַּשְׁקוֹף וְעַל שְׁתֵּי הַמְּזוּזֹת וּפָסַח יְהוָֹה עַל-הַפֶּתַח וְלֹא יִתֵּן הַמַּשְׁחִית לָבֹא אֶל-בָּתֵּיכֶם לִנְגֹּף: 12:23 ‘For the Lord will pass through to smite the Egyptians; and when He sees the blood on the lintel and on the two doorposts, the Lord will pass over the door and will not allow the destroyer to come in to your houses to smite you. (NASB) Based upon the Hebrew syntax, the Lord God Almighty is the one who sees the blood on the lintel (הַמַּשְׁקוֹף) and on the door-posts (הַמְּזוּזֹת) and having seen the blood would not give the destroyer (הַמַּשְׁחִית) to enter into the house and strike down the first born. The English translations translate הַמַּשְׁחִית as “destroyer” or “Slaughterer” depending on the translation. The Aramaic translations on Shemot / Exodus 12:23 (Targum Onkelos) translates הַמַּשְׁחִית using different words, מְחַבְלָא ״לחבלא״ but have the same meaning of “destroyer” or “messenger of injury” according to the Aramaic Lexicon, A dictionary of the Targumim, the Talmud Bavli, and Yerushalmi, and the Midrashic literature, by Marcus Jastro. Targum Pseudo Jonathan states מלאכא מְחַבְלָא meaning “angel messenger of injury, or destroyer.” The Targum Neofiti translates like the Targum Onkelos using the word למחבלא ״למחבלנא״ but the marginal notes in the Targum Neofiti (Neofiti Marginalia) give the translation מלאכא מְחַבְלָא “destroying angel” similar to the Targum Pseudo Jonathan. Therefore, according to the Aramaic translation, the word הַמַּשְׁחִית is understood by the rabbis to be the “angel / messenger destroyer” or as we more commonly know him as the “angel of death.” Brown Driver and Briggs (BDB) Lexicon states that הַמַּשְׁחִית means “ruin, destruction” as it is used in Shemot / Exodus 12:13, יג וְהָיָה הַדָּם לָכֶם לְאֹת עַל הַבָּתִּים אֲשֶׁר אַתֶּם שָׁם וְרָאִיתִי אֶת-הַדָּם וּפָסַחְתִּי עֲלֵכֶם וְלֹא-יִהְיֶה בָכֶם נֶגֶף לְמַשְׁחִית בְּהַכֹּתִי בְּאֶרֶץ מִצְרָיִם: 12:13 ‘The blood shall be a sign for you on the houses where you live; and when I see the blood I will pass over you, and no plague will befall you to destroy you when I strike the land of Egypt. (NASB) The Septuagint (LXX) does not provide any additional insights to the translation for this text where the key word here in the Septuagint from the book of Exodus is ὀλεθρεύοντα (olethreuonta) meaning “annihilating” having the same meaning as “ruin, destruction” according to the BDB Lexicon. Based upon th Torah’s use of the word הַמַּשְׁחִית and the use of the words “Al-tashheth” (אַל-תַּשְׁחֵת), David realizes that his role as a child of the most High God is not to be a messenger of destruction. He is not out for blood (Saul’s blood), and behaving in innocence, with righteousness, and truth, David chooses to save Saul’s life because the Lord had chosen him as king over Israel. David does the righteous thing and does not take Saul’s life even though the Lord God Almighty had delivered Saul’s life into his hands. David continues saying, ב חָנֵּנִי אֱלֹהִים | חָנֵּנִי כִּי בְךָ חָסָיָה נַפְשִׁי וּבְצֵל-כְּנָפֶיךָ אֶחְסֶה עַד יַעֲבֹר הַוּוֹת: 57:1 Be gracious to me, O God, be gracious to me, For my soul takes refuge in You; And in the shadow of Your wings I will take refuge Until destruction passes by. (NASB) How does one’s soul take refuge in the Lord God Almighty in heaven and what is the significance of the phrase “shadow of Your wings?” In a similar manner, in Tehillim / Psalms 11:1, David opens the Psalm stating, “For the choir director a Psalm of David, in the Lord I take refuge; how can you say to my soul flee as a bird to your mountain” (א לַמְנַצֵּחַ לְדָוִד בַּיהֹוָה | חָסִיתִי אֵיךְ תֹּאמְרוּ לְנַפְשִׁי נוּדִו [נוּדִי] הַרְכֶם צִפּוֹר:). In addition to this, Tehillim / Psalms 34 verses 8 and 22 state that a person is blessed (or happy) who take refuge in Him, and that whoever takes refuge in Him will not be condemned. The phrase to take refuge in God is a rather common biblical image or theme, but just what does it mean? In the Tehillim / Psalms 11 study we discussed how the Lord provides a refuge through His abiding presence in our lives making a reference to Parashat Ki Tisa (Shemot / Exodus 30:11-34:35) the Lord made a promise in Shemot / Exodus 33:14 saying, “My Presence will go with you, and I will give you rest” (יד וַיֹּאמַר פָּנַי יֵלֵכוּ וַהֲנִחֹתִי לָךְ:). The Scriptures provide us with rich imagery that describes those who dwell under the “shadow” of God. The imagery tells us about the character of God provides a connection between ancient Israel, the people, and the events of the Apostolic Writings. What does it mean to live under the Shadow? According to David, the best place to be in is God’s shadow. The Torah tells us that shortly after the exodus, the Lord God called Moses up the mountain to give him the “Ten Words” (Shemot / Exodus 20). Later on in the text, the Lord calls Moshe along with 72 elders to go up the mountain. According to these Scriptures, they “beheld God” and shared a covenant-meal in His presence (Shemot / Exodus 24). The Lord reveals to Moshe that He wants him to build a sanctuary for him in Shemot / Exodus 25:8-9, ח וְעָשֹוּ לִי מִקְדָּשׁ וְשָׁכַנְתִּי בְּתוֹכָם: ט כְּכֹל אֲשֶׁר אֲנִי מַרְאֶה אוֹתְךָ אֵת תַּבְנִית הַמִּשְׁכָּן וְאֵת תַּבְנִית כָּל-כֵּלָיו וְכֵן תַּעֲשֹוּ: 25:8 ‘Let them construct a sanctuary for Me, that I may dwell among them. 25:9 ‘According to all that I am going to show you, as the pattern of the tabernacle and the pattern of all its furniture, just so you shall construct it. (NASB) In this section of the Scriptures we are told of a man who was chosen to construct the Tabernacle, the Lord says, ב רְאֵה קָרָאתִי בְשֵׁם בְּצַלְאֵל בֶּן-אוּרִי בֶן-חוּר לְמַטֵּה יְהוּדָה: ג וָאֲמַלֵּא אֹתוֹ רוּחַ אֱלֹהִים בְּחָכְמָה וּבִתְבוּנָה וּבְדַעַת וּבְכָל-מְלָאכָה: ד לַחְשֹׁב מַחֲשָׁבֹת לַעֲשֹוֹת בַּזָּהָב וּבַכֶּסֶף וּבַנְּחֹשֶׁת: ה וּבַחֲרֹשֶׁת אֶבֶן לְמַלֹּאת וּבַחֲרֹשֶׁת עֵץ לַעֲשֹוֹת בְּכָל-מְלָאכָה: 31:2 ‘See, I have called by name Bezalel, the son of Uri, the son of Hur, of the tribe of Judah. 31:3 ‘I have filled him with the Spirit of God in wisdom, in understanding, in knowledge, and in all kinds of craftsmanship, 31:4 to make artistic designs for work in gold, in silver, and in bronze, 31:5 and in the cutting of stones for settings, and in the carving of wood, that he may work in all kinds of craftsmanship. (NASB) Based upon this reading, three things stand out that are related to dwelling in the shadow of God. Bezalel was also from the tribe of Judah. It is interesting to note that his task was to build God’s earthly dwelling place. King David, whose purpose was to build our Father in Heaven a second earthly dwelling place, whose task was passed on to his son Solomon. According to the Scriptures, He was given “the plan” for God’s house “by the Spirit with him” and then passed the blueprints on to his son Solomon (1 Chronicles 28:12 and 2 Samuel 7:12–16). Later on, according to the Apostolic Writings, we read of a Judean King, Yeshua who enabled the indwelling of God’s Spirit in houses of flesh and bone, a house that is not made by human hands. The hand of the Lord casts a shadow over His people. The idea of living under the “shadow” of God is a prominent concept throughout Israel’s history. This concept puts forth the idea that the Lord extended His Presence over those who trusted him and expressed willingness to dwell under His protection. The shadow metaphor comes by descriptions of the Hand of God, the Wings of God, and the Ruach (Wind or Spirit) of God which all convey his loving interest in those who fear him. David says, ב חָנֵּנִי אֱלֹהִים | חָנֵּנִי כִּי בְךָ חָסָיָה נַפְשִׁי וּבְצֵל-כְּנָפֶיךָ אֶחְסֶה עַד יַעֲבֹר הַוּוֹת: 57:1 Be gracious to me, O God, be gracious to me, For my soul takes refuge in You; And in the shadow of Your wings I will take refuge Until destruction passes by. (NASB) The righteous ones (you and I) are to place our soul in God’s hands by trusting and believing in His Word, in His promises, and in His Messiah Yeshua. The significance of the phrase of the “shadow of Your wings,” is the concept of trusting, remaining in our faith, and serving Him according to truth and righteousness by obedience to His commands according to the Torah. David continues saying, ג אֶקְרָא לֵאלֹהִים עֶלְיוֹן לָאֵל גֹּמֵר עָלָי: ד יִשְׁלַח מִשָּׁמַיִם | וְיוֹשִׁיעֵנִי חֵרֵף שֹׁאֲפִי סֶלָה יִשְׁלַח אֱלֹהִים חַסְדּוֹ וַאֲמִתּוֹ: 57:2 I will cry to God Most High, To God who accomplishes all things for me. 57:3 He will send from heaven and save me; He reproaches him who tramples upon me. Selah. God will send forth His lovingkindness and His truth. (NASB) The Masoretic Text literally says “I will call to God Most High, to God who finish/complete/conclude (גֹּמֵר) unto me.” The NASB translates “To God who accomplishes all things for me.” The Lord finishing, completing, or concluding all things, this is only possible if He is ultimately in control and is capable of accomplishing what is necessary to save or deliver. If we place ourselves under His shadow, we give the Lord the opportunity to work in a miraculous way in our lives. Tehillim / Psalms 57:3 states that “He will send from heaven,” either the Lord will send His angels, as in Daniel 3:28, or by His power, the Lord will help in some extraordinary way in either changing the heart of man, or to overcome the enemy that surrounds us. Note that the enemy may come in many forms, take for example “sin,” the Lord gives us the power to overcome sin in our lives. The reproach (שֹׁאֲפִי) which Saul is planning on bringing upon David, the Lord can turn that around for victory, the Lord will send forth His lovingkindness and His truth for the glory of His name. How are lovingkindness and truth sent forth? What does that mean? By now we certainly recognize that the NASB translates khesed by the English word “lovingkindness.” This Hebrew word (khesed) has a great deal more in its full meaning than we can capture in one English word. For example, we can learn something about the translators of the KJV bible the KJV translates khesed as “mercy” 155 times, as “kindness” 43 times, as “lovingkindness” 30 times, and as “goodness” 14 times. Gordon R. Clark has a more comprehensive study on the word khesed in his book titled “חסד‎ – A Study of a Lexical Field.” The word khesed is often the object of the sentence, not the subject; therefore the verb that precedes the word khesed is an important indicator as to what khesed is doing. While not every occurrence of khesed is found in a verb-object relationship, but of those that are, the vast majority follow the verb asah (עשה), translated in the KJV as “sheweth/showed,” refers to something that is done, “to do,” etc. The term asah (עשה) is a common Hebrew verb meaning “to do, to make, to perform;” thus when translating it with khesed as the object, it is more correct to say that one “does” khesed. What is important to understand here is the predominance of God as the one who “does khesed.” There are 245 such references found in the MT, two-thirds of them either describe God as one who “does khesed” or are praises to God because he “does khesed.” Of the remaining third, about half of those also mention khesed in connection with the Lord God. Therefore, khesed is clearly associated with the Lord and may even be used to define having an experience with God similar to what we find here in the Psalm, the Lord sends forth his khesed and truth. Note how this is also connected to being under the shadow of His presence. In addition to this, khesed may also be performed by man, which suggests that khesed is a characteristic that is common between both the nature of man and his relationship with God. Two examples on the word khesed may be found in the Torah, concerning Abraham and Lot. In the narrative on the story of Lot we find a reference to khesed in the words of Lot to the angels who had come to warn him of the impending destruction of Sodom and Gomorrah. After the angels told Lot to leave and travel some distance, Lot’s response was to ask if he could travel to a nearby town in Bereshit / Genesis 19:19-20 he said, יט הִנֵּה-נָא מָצָא עַבְדְּךָ חֵן בְּעֵינֶיךָ וַתַּגְדֵּל חַסְדְּךָ אֲשֶׁר עָשִֹיתָ עִמָּדִי לְהַחֲיוֹת אֶת-נַפְשִׁי וְאָנֹכִי לֹא אוּכַל לְהִמָּלֵט הָהָרָה פֶּן-תִּדְבָּקַנִי הָרָעָה וָמַתִּי: כ הִנֵּה-נָא הָעִיר הַזֹּאת קְרֹבָה לָנוּס שָׁמָּה וְהִוא מִצְעָר אִמָּלְטָה נָא שָׁמָּה הֲלֹא מִצְעָר הִוא וּתְחִי נַפְשִׁי: “19:19 ‘Now behold, your servant has found favor in your sight, and you have magnified your lovingkindness, which you have shown me by saving my life; but I cannot escape to the mountains, for the disaster will overtake me and I will die; 19:20 now behold, this town is near enough to flee to, and it is small. Please, let me escape there (is it not small?) that my life may be saved.’” (NASB) As the Scripture shows, Lot began his request by recognizing that God, or God’s messenger in this case, had already performed khesed by warning Lot of the impending destruction. Therefore Lot was asking for another act of khesed, as implied by virtue of his mentioning that God had already performed khesed on his behalf (e.g. “Now behold, your servant has found favor in your site…”). Similarly, Abraham was acquainted with khesed, both as a giver and a receiver. In Bereshit / Genesis 20, Abraham asked Sarah to show him khesed by saying that she was his sister when they met potentially life-threatening individuals in Bereshit / Genesis 20:13 saying, ג וַיְהִי כַּאֲשֶׁר הִתְעוּ אֹתִי אֱלֹהִים מִבֵּית אָבִי וָאֹמַר לָהּ זֶה חַסְדֵּךְ אֲשֶׁר תַּעֲשִֹי עִמָּדִי אֶל כָּל-הַמָּקוֹם אֲשֶׁר נָבוֹא שָׁמָּה אִמְרִי-לִי אָחִי הוּא: 20:13 and it came about, when God caused me to wander from my father’s house, that I said to her, ‘This is the kindness which you will show to me: everywhere we go, say of me, ‘He is my brother.’’ (NASB) Note how Abraham says זֶה חַסְדֵּךְ אֲשֶׁר תַּעֲשִֹי עִמָּדִי “this is your khesed that you are to do/perform unto me.” Here we find the “performance of khesed” in a word or deed. In Bereshit / Genesis 21, Abimelech, one of Abraham’s neighbors and rivals, wishing to avoid future confrontations, entered into a covenant relationship with Abraham saying in Bereshit / Genesis 21:23, כג וְעַתָּה הִשָּׁבְעָה לִּי בֵאלֹהִים הֵנָּה אִם-תִּשְׁקֹר לִי וּלְנִינִי וּלְנֶכְדִּי כַּחֶסֶד אֲשֶׁר-עָשִֹיתִי עִמְּךָ תַּעֲשֶֹה עִמָּדִי וְעִם-הָאָרֶץ אֲשֶׁר-גַּרְתָּה בָּהּ: 21:23 now therefore, swear to me here by God that you will not deal falsely with me or with my offspring or with my posterity, but according to the kindness that I have shown to you, you shall show to me and to the land in which you have sojourned.’ (NASB) The idea that God sends forth his khesed and truth, means that He will perform something on our behalf for deliverance from a situation, disease, sickness, an enemy, and all of these things will occur for those who remain under His shadow by faith. David continues saying, ה נַפְשִׁי | בְּתוֹךְ לְבָאִם אֶשְׁכְּבָה לֹהֲטִים בְּנֵי-אָדָם שִׁנֵּיהֶם חֲנִית וְחִצִּים וּלְשׁוֹנָם חֶרֶב חַדָּה: , 57:4 My soul is among lions; I must lie among those who breathe forth fire, Even the sons of men, whose teeth are spears and arrows And their tongue a sharp sword. NASB He lives among men who bite, who lie, and he describes this as though one breathed forth fire. The teeth of these men are spears and arrows, and the tongue like a sharp sword, may be a reference to Doeg and His performing lashon hara against David and the priests in the Tabernacle of God. Even though men plot against David in this way, giving their words to the service of evil, death, and destruction, he gives glory to the Lord God Almighty. He says, ו רוּמָה עַל-הַשָּׁמַיִם אֱלֹהִים עַל כָּל-הָאָרֶץ כְּבוֹדֶךָ: 57:5 Be exalted above the heavens, O God; Let Your glory be above all the earth. (NASB) Note the MT the English verse is translated from. David uses the word רוּמָה meaning “discharge cup.” The Aramaic Targum agrees with the MT saying, ו אתרורם על מלאכי שמיא אלהא על כל יתבי ארעא איקרך׃ 57:6 Be exalted over the angels of heaven, O God; your glory is over all those who dwell on earth. (EMC) The word רוּמָה occurs in Tehillim / Psalms 21:14, 57:6, 57:12, and 108:6 and in each case, its usage in the Psalms is exalting the Lord God in heaven. David uses this word to say that the Lord is exalted above the heavens. This is a place that is higher than the heavens, the highest degree possible to glorify His power and goodness, justice and faithfulness, etc. The use of the word for the discharge cup may be similar to raising or lifting a cup to honor Him. David says his enemies, ז רֶשֶׁת | הֵכִינוּ לִפְעָמַי כָּפַף נַפְשִׁי כָּרוּ לְפָנַי שִׁיחָה נָפְלוּ בְתוֹכָהּ סֶלָה: 57:6 They have prepared a net for my steps; My soul is bowed down; They dug a pit before me; They themselves have fallen into the midst of it. Selah. (NASB) The Aramaic Targum states, ז מצדתא אתקינו לאיסתורי כייף נפשי כרו קדמי שייחא נפלו במיצעה לעלמין׃ 57:7 They have set a net for my footsteps; my soul is bowed down; they dug before me a pit, they have fallen into the middle of it forever. (EMC) The Septuagint states, 57:6 παγίδα ἡτοίμασαν τοῖς ποσίν μου καὶ κατέκαμψαν τὴν ψυχήν μου ὤρυξαν πρὸ προσώπου μου βόθρον καὶ ἐνέπεσαν εἰς αὐτόν διάψαλμα 57:6 They have prepared snares for my feet, and have bowed down my soul: they have dug a pit before my face, and fallen into it themselves. Pause. (LXX) The rabbis say that the wicked fall into the pit forever (לעלמין). David had written previously about how the enemy digs a pit to trap the righteous (Tehillim / Psalms 7, 9, and 35). In Tehillim / Psalms 7, David indicated that if we sin and do not repent the very nature of the one who refuses to repent is rooted in lies, untruths, and falsehood. Such a person cannot stand before a Holy God. He continues saying that such people have טז בּוֹר כָּרָה וַיַּחְפְּרֵהוּ וַיִּפֹּל בְּשַׁחַת יִפְעָל: יז יָשׁוּב עֲמָלוֹ בְרֹאשׁוֹ וְעַל-קָדְקֳדוֹ חֲמָסוֹ יֵרֵד: 7:15 He has dug a pit and hollowed it out, And has fallen into the hole which he made. 7:16 His mischief will return upon his own head, And his violence will descend upon his own pate. (NASB) The person who is unrepentant, he has trapped himself, he has dug a pit and has fallen himself into the hole that he has made. Unrighteousness, pride, sin, iniquity, transgressions, lies, untruths, falsehoods, all of these one day will return to the person who “works or labors” (עָמָל) in sin. His violence, his plot and plan for the harm of the innocent, will return back upon him by the instruments which he uses. David also describes the nations in Tehillim / Psalms 9 saying, יז נוֹדַע | יְהֹוָה מִשְׁפָּט עָשָֹה בְּפֹעַל כַּפָּיו נוֹקֵשׁ רָשָׁע הִגָּיוֹן סֶלָה: יח יָשׁוּבוּ רְשָׁעִים לִשְׁאוֹלָה כָּל-גּוֹיִם שְׁכֵחֵי אֱלֹהִים: יט כִּי לֹא לָנֶצַח יִשָּׁכַח אֶבְיוֹן תִּקְוַת עֲנִויִּם [עֲנִיִּים] תֹּאבַד לָעַד: כ קוּמָה יְהֹוָה אַל-יָעֹז אֱנוֹשׁ יִשָּׁפְטוּ גוֹיִם עַל-פָּנֶיךָ: כא שִׁיתָה יְהֹוָה | מוֹרָה לָהֶם יֵדְעוּ גוֹיִם אֱנוֹשׁ הֵמָּה סֶּלָה: 9:15 The nations have sunk down in the pit which they have made; In the net which they hid, their own foot has been caught. 9:16 The Lord has made Himself known; He has executed judgment. In the work of his own hands the wicked is snared. Higgaion Selah. 9:17 The wicked will return to Sheol, Even all the nations who forget God. 9:18 For the needy will not always be forgotten, Nor the hope of the afflicted perish forever. 9:19 Arise, O Lord, do not let man prevail; Let the nations be judged before You. 9:20 Put them in fear, O Lord; Let the nations know that they are but men. Selah. (NASB) It is interesting here that in both the Hebrew and Aramaic translations we read the יח יתובון רשיעי לשייול כולהון עממיא דאשליו דאיתנשיו דחלתא דיהוה אלהא׃ 9:18 The wicked will return to Sheol, all the Gentiles who neglected the fear of the Lord. (EMC) Both the Hebrew and Aramaic text indicate that the wicked return to the grave. Does this suggest that the wicked, all those who do not fear the Lord, the Gentiles, their state of being is in the grave? They come and go from the grave (שְׁאוֹלָ), their habitation is in the grave? Based on the description given, sin, unrighteousness, and wickedness are all synonymous to death. The Lord has executed judgment upon the nations and the result is that they have fallen into the pit they have made. This means the plans that our enemies have made for us, to destroy us, will return back upon them and this is the righteous judgment of God. David realizes that the Lord in heaven has the power to save both body and soul from destruction saying the following, ח נָכוֹן לִבִּי אֱלֹהִים נָכוֹן לִבִּי אָשִׁירָה וַאֲזַמֵּרָה: ט עוּרָה כְבוֹדִי עוּרָה הַנֵּבֶל וְכִנּוֹר אָעִירָה שָּׁחַר: י אוֹדְךָ בָעַמִּים | אֲדֹנָי אֲזַמֶּרְךָ בַּל-אֻמִּים: יא כִּי-גָדֹל עַד-שָׁמַיִם חַסְדֶּךָ וְעַד-שְׁחָקִים אֲמִתֶּךָ: יב רוּמָה עַל-שָׁמַיִם אֱלֹהִים עַל כָּל-הָאָרֶץ כְּבוֹדֶךָ: 57:7 My heart is steadfast, O God, my heart is steadfast; I will sing, yes, I will sing praises! 57:8 Awake, my glory! Awake, harp and lyre! I will awaken the dawn. 57:9 I will give thanks to You, O Lord, among the peoples; I will sing praises to You among the nations. 57:10 For Your lovingkindness is great to the heavens And Your truth to the clouds. 57:11 Be exalted above the heavens, O God; Let Your glory be above all the earth. (NASB) David says that his heart is “true” or “correct” (נָכוֹן). What does it mean to have a correct or true heart? Having a true heart seems to be a reference to one’s inward life. David may be describing how his heart is fixed upon the Lord, his whole heart seeks the Lord. So he gives his heart to be joyful in song with the harp and lyre, and gives thanks to the Lord for his grace (חַסְדֶּךָ), he is exulted above the heavens. The Aramaic Targum and the Septuagint translate these verses in the following way. Notice how the rabbis say that David’s heart is turned to God’s Torah. A true heart looks to God’s ways and has the intent of applying His ways to one’s life. (Note what the Apostle John writes in 1 John 2 and 5 with regard to obeying the command of God.) He concludes saying the Lord is exalted above the angels of heaven and above the inhabitants of the earth. The Septuagint states that his heart is ready and for this he sings unto the Lord in the midst of the nations. Does your heart sing for joy like David’s heart because of the way in which the Lord has worked in your life? The grace and truth of God is certainly reason to give glory to the name of the Lord. Let’s ask the Lord to help us to have true hearts, to seek His ways, and to have the power of the resurrection in our lives to overcome sin. Let’s Pray! 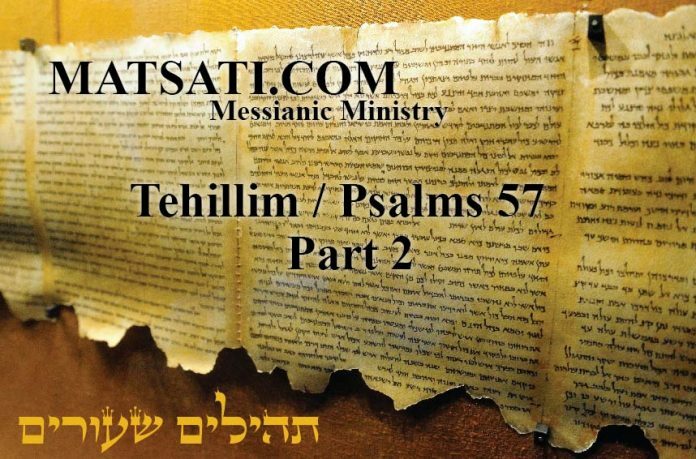 The Rabbinic Commentary (Midrash) on Tehillim / Psalms 57 has 4 parts. Reading through the Midrash we will be looking at Part 1, 2, 3, and 4. Let’s begin by outlining Midrash Tehillim Chapter 57, Part 1, 2, 3, and 4. Outline of Midrash Tehillim / Psalms, Chapter 57, Part 1, 2, 3, and 4. The משל (mashal) “the parable,” goes on to explain the פתיחתא (Petihta), the rabbis go on to discuss the idea of being merciful. The נמשל (Nimshal) “expansion on the parable” expands upon the משל (mashal), the rabbis expand upon being merciful and use examples from Saul and whether David sinned he would find mercy in God’s hands. The משל (mashal) “the parable,” goes on to explain the פתיחתא (Petihta), the rabbis go on to discuss crying out to God. The נמשל (Nimshal) “expansion on the parable” expands upon the משל (mashal), the rabbis expand by looking at three things, tithes, greeting with God’s name, and reading the scroll of Esther, and what happened when Israel neglected these things. The משל (mashal) “the parable,” goes on to explain the פתיחתא (Petihta), the rabbis go on to discuss how the Lord rend the kingdom from Saul. The נמשל (Nimshal) “expansion on the parable” expands upon the משל (mashal), the rabbis expand upon the dibur hamathil with a dialogue between Saul and Samuel. The משל (mashal) “the parable,” goes on to explain the פתיחתא (Petihta), the rabbis go on to discuss these opening words of being away. The נמשל (Nimshal) “expansion on the parable” expands upon the משל (mashal), the rabbis expand upon the opening words to make a comparison to waking early and sleeping in late, to kings and to David. א למנצח אל תשחת לדוד מכתם בברחו מפני שאול במערה חנני (ה׳) [אלהים] חנני כי בך חסיה נפשי. למה שתי פעמים חנני, חנני שלא אפול ביד שאול, שאם אפול בידו אינו חס עלי, חנני שלא יפול שאול בידי, שלא יפתה אותי יצר הרע ואהרגהו, הוי חנני (ה׳) [אלהים] חנני. ובצל כנפיך אחסה עד יעבור הוות. הוותו של שאול. דבר אחר חנני. שלא אכשל בדבר עבירה. ]חנני שאם חס ושלום אחטא, בך חסיה נפשי, שאחזור בתשובה[. עד יעבור הוות. שאתה מכפר על עונותי. דבר אחר חנני. שלא יגרמו העונות ויחרב הבית, חנני בגלות. בך חסיה נפשי, במלכיות, שלא יהיו מכלות אותנו. עד יעבור הוות, הוותן של מלכיות, ותשיבני לבית מקדשך, ושם אתפלל ואודה. 1. For the leader; Al-tashheth. A Psalm of David; Michtam; when he fled from Saul, in the cave. Be merciful unto me, O God, be merciful unto me, for my soul takes refuge in You (Tehillim / Psalms 57:1-2). Why did David say twice, Be merciful unto me? Be merciful unto me that I fall not into the hand of Saul, for if I fall into his hand he will not spare me; and Be merciful unto me that Saul fall not into my hand, so that the Inclination to evil entice me not and I kill Saul. Hence, David said twice, Be merciful unto me, O God, be merciful unto me, Yea, in the shadow of Your wings will I take refuge, until these calamities be past, these calamities from Saul. Another comment, Be merciful unto me, so that, if God forbid, I do sin, In You will my soul take refuge, returning in penitence until these calamities be past, that is, until You have brought me to expiate my iniquities. Another comment, Be merciful unto me, that is, unto Israel, so that iniquities will not cause the Temple to be destroyed. Be merciful unto me in exile. In You will my soul take refuge among the kingdoms so that they will not consume me utterly. Until these calamities be past, when the calamities from the kingdoms are past, You will return me to Your sanctuary where I will pray and give thanks. The midrash opens saying, “For the leader; Al-tashheth. A Psalm of David; Michtam; when he fled from Saul, in the cave. Be merciful unto me, O God, be merciful unto me, for my soul takes refuge in You (Tehillim / Psalms 57:1-2).” The rabbis shorten verse two of the Psalm as compared to the MT, א לַמְנַצֵּחַ אַל-תַּשְׁחֵת לְדָוִד מִכְתָּם בְּבָרְחוֹ מִפְּנֵי-שָׁאוּל בַּמְּעָרָה: For the choir director; set to Al-tashheth. A Mikhtam of David, when he fled from Saul in the cave. (NASB) ב חָנֵּנִי אֱלֹהִים | חָנֵּנִי כִּי בְךָ חָסָיָה נַפְשִׁי וּבְצֵל-כְּנָפֶיךָ אֶחְסֶה עַד יַעֲבֹר הַוּוֹת: 57:1 Be gracious to me, O God, be gracious to me, For my soul takes refuge in You; And in the shadow of Your wings I will take refuge Until destruction passes by. (NASB) The midrash asks the question of why David repeated himself asking the Lord to be merciful (חָנֵּנִי) to him? The rabbis say that he asked twice so that both David and Saul would be spared. David asks the Lord twice to be merciful and the manner in which his request is made is such that neither one of them fall into each others hands. If David were to fall into Saul’s hands, Saul would show no mercy. If Saul were to fall into David’s hands, David is worried that his evil inclination would entice him to kill Saul. Thinking on the idea that David’s inclination might cause him to kill Saul, the rabbis in Midrash Rabbah Bereshit, Parashat 89, Part 1 (מדרש רבה בראשית פרשה פט סימן א) speak of an Evil Tempter who exists and is able to cause trouble for mankind. And it came to pass at the end of the two full years, etc (Bereshit / Genesis 41:1). It is written, He sets an end to darkness, etc (Job 28:3), a definite period was set for the world to spend in darkness. What is the proof? He sets an end to darkness… the stones of thick darkness and the shadow of death. For as long as the Evil Tempter exists in the world, thick darkness and the shadow of death are in the world; when the Evil Tempter will be uprooted from the world, thick darkness and the shadow of death will pass away from the world. Another interpretation of, He sets an end to darkness, a definite number of years was fixed for Joseph to spend in prison. When the appointed time came, Pharaoh dreamed a dream, thus, And it came to pass at the end of two full years, etc. א ויהי מקץ שנתים ימים, (איוב כח) קץ שם לחשך, זמן נתן לעולם כמה שנים יעשה באפילה, ומאי טעם קץ שם לחושך שכל זמן שיצר הרע בעולם אופל וצלמות בעולם, דכתיב (שם איוב כ״ח) אבן אופל וצלמות, נעקר יצר הרע מן העולם אין אופל וצלמות בעולם, דבר אחר קץ שם לחשך, זמן נתן ליוסף כמה שנים יעשה באפילה בבית האסורים, כיון שהגיע הקץ חלם פרעה חלום. Notice how the rabbis write about David providing us David’s thoughts that “if I do sin, in You will my soul take refuge” illustrating the merciful God we serve. The sentence continues saying “until You have brought me to expiate my iniquities.” The concept that is being put forward in the midrash is that David needed to pay for his sins before God. What does it mean that one must “expiate” their iniquities here in the midrash? It is interesting that the Scriptures describe three methods of atonement, (i) the sin sacrifice, (ii) repentance, and (iii) charity. In addition to this, the sin sacrifice (Chatat Korban) did not atone for all types of sin, but rather only for man’s unintentional sins. The sin sacrifice was not sufficient to atone for transgressions committed intentionally. According to the Torah, the brazen sinner was barred from the sanctuary and had to bear his own iniquity because of his rebellion against God. This fundamental principle is taught in Bamidbar / Numbers 15:27-31. In addition to this, one needed to repent of their sins. Repentance (Teshuva) is the process of turning from sin. Charity can be described as an act of living in a state of repentance. One’s life is changed from a wicked sinner to a righteous soul who lives to serve the Lord God in heaven. Relying upon the sacrifice of the Messiah Yeshua alone without having a repentant heart and a changed new life, is there really salvation in such a state? To say that we believe in God’s Messiah but do not turn from our sins, what do you think is the end result of such a person? Midrash Tehillim 57, Part 1 concludes saying, “In You will my soul take refuge among the kingdoms so that they will not consume me utterly. Until these calamities be past, when the calamities from the kingdoms are past, You will return me to Your sanctuary where I will pray and give thanks.” Taking refuge in the Lord is to trust in Him and only by trusting in Him can our souls be at peace in the midst of the calamities that surround us on a daily basis. Midrash Tehillim 57, Part 2 opens with the Dibur Hamathil (דיבור המתחיל) saying “I will cry unto God Most High; unto God that approves the cause I have in hand (Tehillim / Psalms 57:3).” The homiletic introduction to the midrash states, “Rabbi Simon taught in the name of Rabbi Joshua son of Levi, Concerning three things, tithes, greeting with God’s name, and reading the Scroll of Esther, the Holy One blessed be He, approved the decree of a court on earth.” The rabbis are discussing three things that the Lord God approves “the cause that I have in hand,” and say this is related to the tithe, greeting in God’s name, and a court on earth. The Torah instructs that one must give charity to the needy in Devarim / Deuteronomy 15:7-8 “If there is a poor man amongst you . . . open your hand wide . . .” The Torah never specifies how much money one must give. The Law commands agricultural tithes and so a few Jewish commentators have expanded the obligation to include tithing on all income (Talmud Bavli Tosafot Taanit 9a). Other commentators, however, asserted that the obligation stemmed only from rabbinic decree (Shu’’t Maharil 152, שו״ת מהרי״ל החדשות), with some even downgrading it to the level of a custom. Whatever its legal origins, traditional Jewish practice has long viewed giving 10% of one’s income as a benchmark, and 20 percent as an extremely meritorious act of charity. Traditional Jewish law and practice has included various forms of tithing since ancient times as we know according to the Torah (see Bereshit / Genesis 14). Orthodox Jews commonly practice ma’aser kesafim (the tithing 10% of income to charity). Modern Israel continues to follow the laws of agricultural tithing, e.g., ma’aser rishon, terumat ma’aser, and ma’aser sheni. In Christianity, some interpretations of Biblical teachings conclude that although tithing was practiced extensively in the Tanach, it was never practiced or taught within the first-century Church. Instead, the Apostolic Writings are seen as teaching the concept of “freewill offerings” as a means of supporting the church, for example in 1 Corinthians 16:2 and 2 Corinthians 9:7. In fact, according to the book of Acts, a few of the earliest groups of believers sold everything they had and held the proceeds in common to be used for the furtherance of the Gospel (Acts 2:44-47, 4:34-35). According to Acts 5:1-20 we read of the account of a man and wife (Ananias and Sapphira) who were living in one of these groups. They sold a piece of property and donated only part of the selling price to the church but claimed to have given the whole amount. As a result of their lie, they immediately fell down and died when confronted by the apostle Peter over their dishonesty. The tithe historically has held a very high place in the Scriptures, Christianity, and Judaism, and the rabbis continue in the midrash on the topic of the tithe saying the following. The tithe is paralleled to the going into exile, the midrash states, “And the proof that God approved the decree concerning tithes? We are taught that the children of Israel were not taken in to captivity until they neglected the giving of tithes, of which Scripture ordained, These are the statutes and the ordinances, which you will observe to do in the land which the Lord has given you (Devarim / Deuteronomy 12:1).” Upon returning to the land of Israel, the people observed the tithe on their own accord. The rabbis continue saying that whether Israel goes into captivity or not, they will observed the tithe, and that the tithe is something that is approved of God based upon the Psalm that says “unto God that approves the cause I have in hand.” These concepts towards the tithe and the belief that the Lord stands behind (approves) of the one who tithes, is also found in the Apostolic Writings, according to James 1:27 Pure and undefiled religion in the sight of our God and Father is this: to visit orphans and widows in their distress, and to keep oneself unstained by the world. (NASB) and based upon Mishley / Proverbs 28:27 If you give to the poor, your needs will be supplied! But a curse upon those who close their eyes to poverty, visiting and take care of the poor, widows, orphans, these things are approved of the Lord God in heaven. The midrash equates a man who withholds a tithe as robing God. Why do you think withholding a tithe is synonymous to robing God? The rabbis say robbery is achieved in “tithes and heave offerings” (Malachi 3:8). The idea here is found in the neglect to obey the command. We are commanded to give a tithe, and the rabbis say that when we with hold our tithe, we restrain God’s hand from going out into the world and making the world prosper. How does withholding the tithe restrain God’s hand? It might be that when we give charity through the tithe, the person who receives the offering is blessed and they can see the Lord God working and living within you to do good towards others. Midrash Tehillim 57, Part 2 concludes saying, “And should you say that Boaz spoke thus unto his own accord, but that in heaven they did not approve of what he said, then mark what the angel said to Gideon, The Lord is with you, you mighty man of valor (Judges 6:12).” The point of this midrash is that the Lord stands behind the man who tithes for the purpose of doing good towards others. Here Boaz and Gideon are compared. Boaz and Ruth (from the book of Ruth), the midrash states that Boaz spoke for his own accord and was not approved of God, whereas Gideon went out to fight for Israel and he was approved of God. The idea is that we are to do unto others and not for ourselves only. In the tithe, we do unto others and unto God, when we do so with a pure heart, and in doing so the Lord is pleased. ג אמר ר׳ תחליפא דמן קיסרי בשעה שעבר שאול על גזירתו של הקב״ה בעמלק, ובא שמואל והוכיחו, שנאמר יען (אשר עברת את פי ה׳) [מאסת את דבר ה׳] (ש״א שמואל א׳ טו כג), וכיון שביקש לילך לו קרע לו את מעילו, שנאמר ויסב שמואל ללכת (ויאחז) [ויחזק] בכנף מעילו ויקרע ויאמר אליו שמואל קרע ה׳ את ממלכות ישראל מעליך היום [ונתנה לרעך הטוב ממך] (שם שמואל א׳ טו כז כח), אמר לו ומי הוא זה ריעי הטוב ממני שימלוך תחתי, אמר ליה רמז אני רומז לך, מי שקרע את מעילך, הוא עתיד ליטול מלכותך, וכשנכנס שאול למערה, וכרת דוד כנף מעילו, מיד נזכר שאול מה שאמר לו שמואל, התחיל לומר ידעתי כי מלוך תמלוך (שם שמואל א׳ כד כא), מלוך בעולם הזה, תמלוך לעולם הבא, שנאמר ועבדי דוד מלך עליהם (יחזקאל לז כד). 3. Rabbi Tahalifa of Ceasarea taught, At the time that Saul violated the decree of the Holy One blessed be He, concerning Amalek, Samuel came and rebuked him, saying You have rejected the word of the Lord (1 Samuel 15:26); and as Samuel turned to go away, he rent Saul’s robe, as is said And as Samuel turned about to go away, he laid hold upon the skirt of his robe, and it rend. And Samuel said to him, The Lord has rent the kingdom of Israel from you this day, and have given it to a neighbor of yours, that is better than you (1 Samuel 15:27-28). Saul asked, And who is this neighbor of mine who is better than I, and who will rule instead of me? Samuel answered, I will give you a clue, he who rends your robe will take away the kingship. And when Saul entered into the cave, and David cut off the skirt of his robe, Saul remembered at once what Samuel had told of him. Thereupon, Saul said, I know that as king you will rule (1 Samuel 24:21). You will be king in this world, and you will rule in the world to come, for it is said, And My servant David will be king (Ezekiel 37:24). In Luke 10:29, the lawyer stood up and asked “And who is my neighbor?” The text suggests the lawyer was self-righteous, and possibly contentious with Yeshua’s teaching on loving your enemy previously. It is easier to hate one’s enemy than to love, and the question of the scholar is that one’s neighbor could be his enemy (e.g. the neighboring nations). As best that we can tell from the text, the lawyer was at ease with his conscience, having paid his tithes, fasting, observing the feast days carefully, never neglecting the liturgy, etc, he felt he had made for himself a place in heaven. As regards to the observance of the Torah and before God, his conscience was at ease. And so looking to justify himself, he asks, “And who is my neighbor?” His question asks a further question, “Master, tell me, who do you teach should be included in the term neighbor?” Yeshua goes on to illustrate the concept of a neighbor, in the parable of a man traveling to from Jerusalem to Jericho. It is interesting in Yeshua’s illustration he says a man is traveling from Jerusalem to Jericho. What is the significance of the man traveling from Jerusalem to Jericho? When Israel crossed the Jordan and entered the Promised Land, the first city they encounter is the city of Jericho in 1451 BCE. Joshua was been given strict instructions from God regarding how to take (conquer) the city. The city was surrounded by strong walls and was well fortified. The miraculous plan given Joshua was for the entire Israelite army to march around the city once each day for six days, then, on the seventh day, march around it seven times. The trumpets were then to be sounded and everyone was to give a great shout, and the walls crumbled to the ground. The army of Israel then killed all who were in the city except Rahab. The important point about this regarding Yeshua’s parable is the warning God gave following the destruction of the city in Joshua 6:26. The Scripture says “Cursed be the man before the Lord that raises up and builds the city and lays its foundation, etc.” Yeshua says in his illustration that a man was leaving Jerusalem to travel to Jericho. This illustrates for us that the man was leaving Jerusalem, the blessed city of Zion, based on the opening verse of the parable, the type of man (the neighbor) may be paralleled to a person who had left the covenant people for an accursed place (Jericho). This type of man would not be someone whom the rabbis would have taught to take care of, to be good to, or to give your time to helping, etc. This man was an unrighteous man who did not believe the Scriptures, did not love God or Israel, and was going to Jericho. Yeshua says that even such a person is your neighbor. In the midrash, Saul asks “And who is my neighbor” however his question is based upon a man of God, David, who is not an unrighteous man. In Yeshua’s parable he says a priest and a Levite pass the person by, but a Samaritan, a despised people, has the heart to take care of the man who was robbed, beaten, and left for dead. The Samaritan acted as a neighbor, whereas the priest and the Levite did not. The idea is that we are to do similar, to help, and to do what is necessary to take care of our neighbor, regardless of whether the person is unrighteous, wicked, or an enemy. Midrash Tehillim 57, Part 3 concludes saying, “You will be king in this world, and you will rule in the world to come, for it is said, And My servant David will be king (Ezekiel 37:24).” If we take into consideration the importance of being selfless, humble, and a servant towards others, the concluding phrase of the midrash, “You will be king in this world and you will rule in the world to come” is a true statement that applies to each of us as well. Do you believe this is true? ד עורה כבודי [עורה הנבל וכנור אעירה שחר]. איתער איקרי מן קומי איקרי דבריי, איקרי לא חשיב כלום, קומי אייקרי דבריי. אעירה שחר. אנא הוינא מעיר שחרא ושחרא לא הוה איתער לי, והיה יצרו מקטרגו, ואמר לו דוד דרכן של מלכים [להיות השחר מעוררן, ואת אמר אעירה שחר, דרכן של מלכים] להיות ישינים עד שלש שעות, ואתה אומר חצות לילה אקום להודות לך, והוא אומר (למשפטי) [על משפטי] צדקך, ומה היה דוד עושה, ר׳ פנחס בשם ר׳ אלעזר בר׳ מנחם אומר היה נוטל כנור ונבל ־ ונותנו תחת מראשותיו, ועומד בחצי הלילה, ומנגן בהם, כדי שישמעו חביריו בתורה ויקומו, ומה היו חבירי תורה אומרים, ומה אם דוד המלך עוסק בתורה, אנו על אחת כמה וכמה. אמר ר׳ לוי כנור היה תלוי כנגד חלונותיו של דוד, והיתה רוח צפונית יוצאת בחצי הלילה ומנפנפת בו, והיה מנגן מאליו, הדא הוא דכתיב והיה כנגן המנגן (מ״ב מלכים ב׳ ג טו), במנגן אין כתיב כאן, אלא כנגן המנגן, שהיה הכנור מנגן מאליו. 4. Awake, my glory (Tehillim / Psalms 57:9). David said, Awake, my glory for the sake of my Master’s glory, my glory being nothing before my Makers glory. I will awake the dawn. David said, I will awake the dawn, the dawn will not awake me. Thereupon, his inclination to evil reproached him saying, David, is it the way of the kings that the dawn awake them? Yet you declare I will awake the dawn. Though it is the way of the kings to sleep three hours into the day, you declare At midnight I will rise to give thanks unto You (Tehillim / Psalms 119:62). Thereupon, David replied, And so I will, saying to God, Because of Your righteous ordinance. What did David use to do? Rabbi Phinehas in the name of Rabbi Eleazar son of rabbi Menahem, David used to take a harp and a psaltery, put them under his head, and rise at midnight and play them, so that his companions in study of Torah would hear and rise. And what did his companions in study of Torah used to say? If King David is occupied with Torah, how much more and more should we be. Rabbi Levi taught, A harp have hung across David’s window, and when the north wind came up at midnight, it blew through the harp, which then played off of itself. Of this, it is written, when the instrument played (2 Kings 3:15), note that it is not written when minstrel played, but When the instrument played meaning that the harp played of itself. In the midrash, the rabbis say, “David said, I will awake the dawn, the dawn will not awake me” meaning that he will wake before the dawn rather than allowing dawn to wake him. This implies that David is awaking in anticipation for the day to pray (according to the Targum) and to sing of the glory of God (according to the MT). The midrash continues saying that his inclination to evil (יצרו מקטרגו) reproached him saying that it is the way of kings that the dawn awakes them. Notice here that the midrash does not use the typical phrase in the Hebrew text “Yetzer Hara” (יצר הרע) to describe the evil inclination, but rather they say “Yetser Maktargu” יצרו מקטרגו. The word Matargu (מקטרגו) is a masculine noun meaning “accuser, prosecutor” and the idea is that the inclination to evil is functioning as an accuser making the accusation that if you are a king, you need to sleep in and allow the sun rise to wake you and not the other way around. In other words, kings are supposed to be lazy and not raise until the sun comes up. David on the other hand prefers to rise before the sun does. Thereupon, David replied, And so I will, saying to God, Because of Your righteous ordinance. What did David use to do? Rabbi Phinehas in the name of Rabbi Eleazar son of rabbi Menahem, David used to take a harp and a psaltery, put them under his head, and rise at midnight and play them, so that his companions in study of Torah would hear and rise. And what did his companions in study of Torah used to say? If King David is occupied with Torah, how much more and more should we be. Rabbi Levi taught, A harp have hung across David’s window, and when the north wind came up at midnight, it blew through the harp, which then played off of itself. The point of the midrash is that David raises early to pray, to sing, and to give glory to the Lord, and occupy himself in the study of the Torah. Torah study generally is performed in a specific place, the beit Midrash or house of study, a room is designated or set aside for this purpose. Times are chosen during the week or during the day for study. Studying the Torah begins with a prayer thanking God for “commanding us to occupy ourselves with the words of the Torah” with another prayer asking the Lord to enable us and our descendants to enjoy the knowledge of God through the study of His Torah. Studying the Torah focuses not on a simple absorption of the material in the bible, but on a dialogue among students and between students and the text. This type of study is standardized by the page layout of many classical texts such as is found in the Talmud. Midrash Tehillim 57 suggests that David raised early to pray and to study the Torah with his friends which is consistent with the dialogue type style of study today. The question might be asked though, “Why Study the Torah?” The best answer for this question is that the Torah is full of both spiritual and physical concepts about how to “Love our neighbors as ourselves and how to love God.” In addition to this, studying Torah gives us the knowledge that we do sin and we are in need of a savior. Over the course of time, little sins tend to not bother us as much, and as a result, we tend to compromise our faith here and there. The study of the Torah draws us back to the way of the Lord and puts in our minds and our hearts the need to repent and turn from our sins. The midrash states that David played his harp so his friends would hear, wakeup and study too. Rabbi Levi taught that David hung his harp across the window so that when the wind blew, it would play music by itself. Midrash Tehillim 57, Part 4 concludes saying, “Of this, it is written, when the instrument played (2 Kings 3:15), note that it is not written when minstrel played, but When the instrument played meaning that the harp played of itself.” The harp playing on its own in the concluding phrase may be paralleled to the Lord being pleased with David for raising early to pray and to study. Do you think the Lord is please when we study His word like we read here in the midrash? I believe that He is pleased when we have a desire to draw near by the study of His word. Let’s Pray! Next articleBits of Torah Truths, Parashat Vayechi, Why Judah? Parashat VaYakhel, Is there hope in the mitzvot?